Dashboard > Plugins > Installed Plugins > ELEX Dynamic Pricing and Discounts for WooCommerce > Settings. Go to the Shop page and add the products to the cart to see the plugin in action. In this type of rule, the price adjustment or discount is applied at the product level. Go to Discount Rules > Product Rules. Go to the Shop page. Add the products Cap and SmartWatch to the Cart. Two sample Product rules are shown in the screenshot on the left. In the first rule, 50% discount is offered when five or more units of Cap are bought. In the second rule, a flat $10 discount is offered when two or more units of product SmartWatch are bought. In addition to this, you can set up a maximum discount amount, price adjustment, discount validity period among other restrictions. For more detailed information, read Product Rules section in setting up documentation. In this type of rule, the price adjustment is applied to a combination of products. Go to Discount Rules > Combinational Rules. A sample combinational rule is shown in the screenshot on the right. In the given combinational rule, when 1 unit of SmartWatch is bought with 2 units of Cap, a discount of 40% is applied. In addition to this, you can set up a maximum discount amount, price adjustment, discount validity period, apply the discount on selected products and so on. For more detailed information, read Combinational Rules section in setting up documentation. The price adjustment is applied to Product Categories. Go to Discount Rules > Category Rules. Go to the Shop Page to see the Clothing category. Add any two products from the category to see the rule in action. A sample category rule is shown in the screenshot on the left. In the given rule, when two items are bought from Clothing product category, a discount of 50% is applied. For more detailed information, read Category Rules section in setting up documentation. Similar to product combinational rules, you can apply the price adjustment to the combination of product categories. The only difference is that instead of selecting products, you need to select desired product categories. Go to Discount Rules > Category Combinational Rules. In addition to dynamic pricing and discounts, you can set up a maximum discount amount, price adjustment, discount validity period among other restrictions. For more detailed information, read Category Combinational Rules section in setting up documentation. Apply price adjustments and discounts on the Cart. Go to Discount Rules > Cart Rules. Go to the Shop Page and add three units of Woo T-Shirt to the cart to see the rule in action. A sample cart rule is shown in the screenshot on the left. 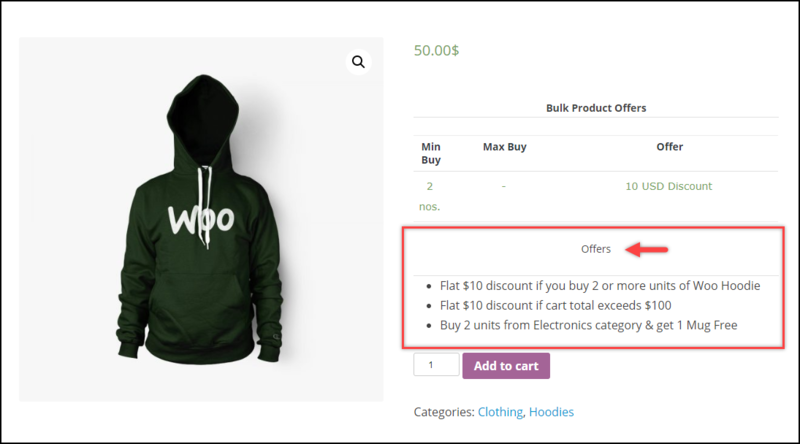 In the given cart rule, when the cart total amount exceeds $100, a flat discount of $10 is applied. In addition to this, you can set up a maximum discount amount, price adjustment, discount validity period, product attribute, payment method, shipping method among other restrictions. For more detailed information, read Cart Rules section in setting up documentation. Offer one item(free or price adjusted) when a selected item is bought. Go to Discount Rules > BOGO Rules. Go to the Shop Page and add five units of Caps and one unit of SmartWatch to the cart to see the rule in action. A sample BOGO rule is shown in the screenshot on the right. In the given BOGO rule, when five Caps are bought, one SmartWatch is offered for Free. For more detailed information, read BOGO Rules section in setting up documentation. Offer one item(free or price adjusted) when a selected an item of selected category is bought. Go to Discount Rules > BOGO Category Rules. For more detailed information, read BOGO Category Rules section in setting up documentation. The Pricing table would display all the Product rules associated with a particular product, as shown in the screenshot on the right. To customize this table, go to Settings > under Options section > Pricing Table. For more detailed information, read Pricing Table section in the setting up documentation. The Offer table would display all the available rules associated with a particular product, as shown in the screenshot on the left. To customize this table, go to Settings > under Options section > Offers Table. For more detailed information, read Offers Table section in the setting up documentation. 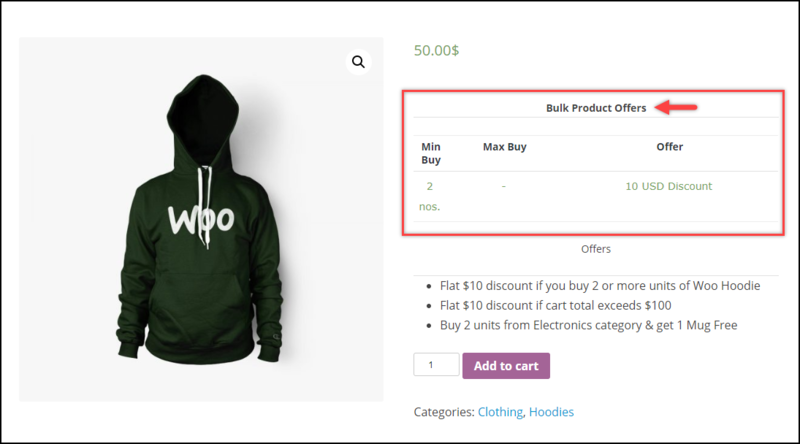 For plugin configuration, read How to Setup Dynamic Pricing and Discounts Plugin for WooCommerce? For business cases and knowledge base, explore the product documentation.